Emission controls, first introduced in the US in 1964, have proven over time to be a good thing -- today's cars have very low emissions, but super-high power (in fact, they have more horsepower than pre-emissions cars). 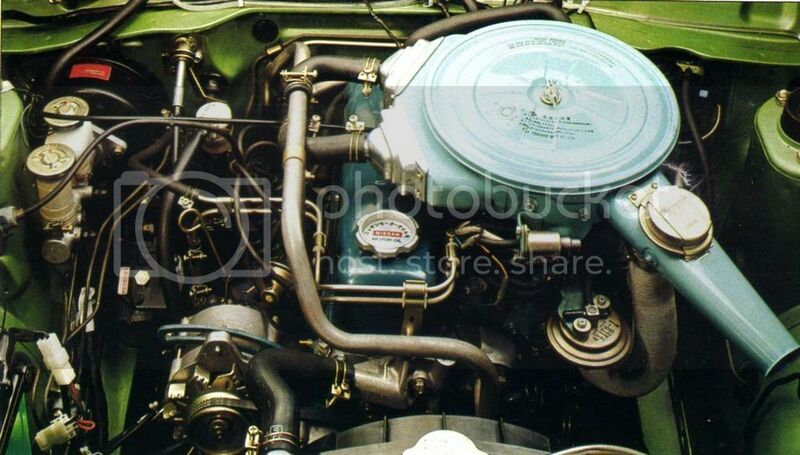 However, some of the early systems hurt engine performance, including some of those used by the Datsun 1200. 7 Which controls can be eliminated? EVAPO: Signifies B110 with crankcase emission control, exhaust emission control, and evaporative emission control device for CALIFORNIA in U.S.A. It appears that all USA models meet the California requirements as they all have EVAPO parts. 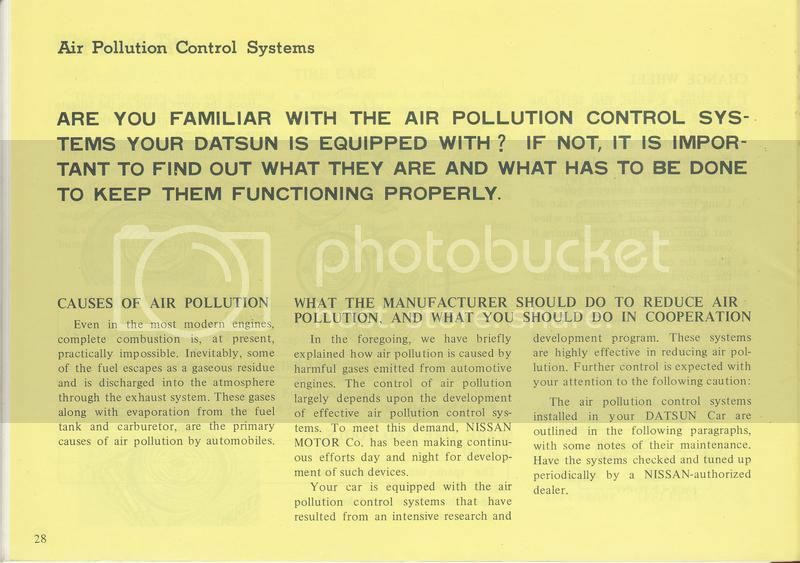 control systems your Datsun is equipped with? Unburned Hydrocarbons (HC). Basically this means partially burned gasoline. Not only does it smell bad, it is toxic, cancer causing and contributes to smog. In a perfectly efficient engine, all HC would be converted to water (H2O) and Carbon Dioxide (CO2). This would result in the greatest fuel effiency. Since unburned gasoline means bad fuel economy this is a good performance goal, as well as an emission-control goal. Note that engines produce maximum horsepower with a rich air/fuel ratio for various reasons, but this is bad for pollution. Most cars run rich at full-throttle (even new cars) since it is generally not a strict part of emission test procedures. Carbon Dioxide (CO2) emissions which -- as a greenhouse gas -- is now known to contribute to the global warming effect. But it was not regulated in 1971-1973 automobiles. For more information on automotive emission control, see wikipedia:Automobile emissions control. * Idle CO, automatic transmission: 1.0-2.0% @ 650 RPM in "D"
Some states have emission testing in urban areas. California is notable, but many other states also have a yearly or bi-yearly requirement. The good news it that no state is currently requiring a Datsun 1200 to be tested. Datsun 1200s were made for model years 1971-1973 and so are past 25-year rules (e.g. Washington State) and 32-year (California) rules. 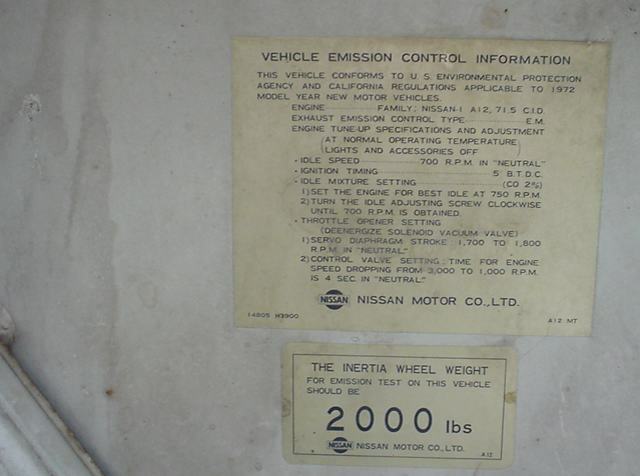 However, if you import a newer Datsun 1200 truck into your country, it will be subjected to the 15-year rule (Canada) or 25-year rule (USA). Vehicles newer than this will be required to meet emission control standards using a smog test. 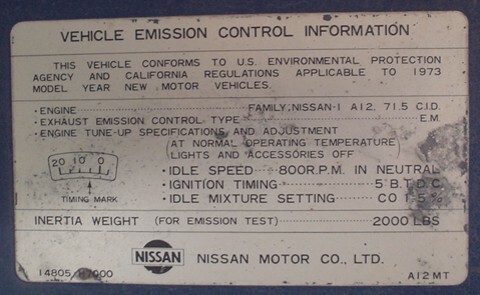 Datsun 1200s in different markets came with different emission-control equipment. Some markets had minimal controls (those related to performance, like PCV) while USA models had the most controls to meet pioneering California rules. Positive Crankcase Ventilation (PCV) was the very first of the emission controls. This is a good system, and can actually help power and fuel economy. 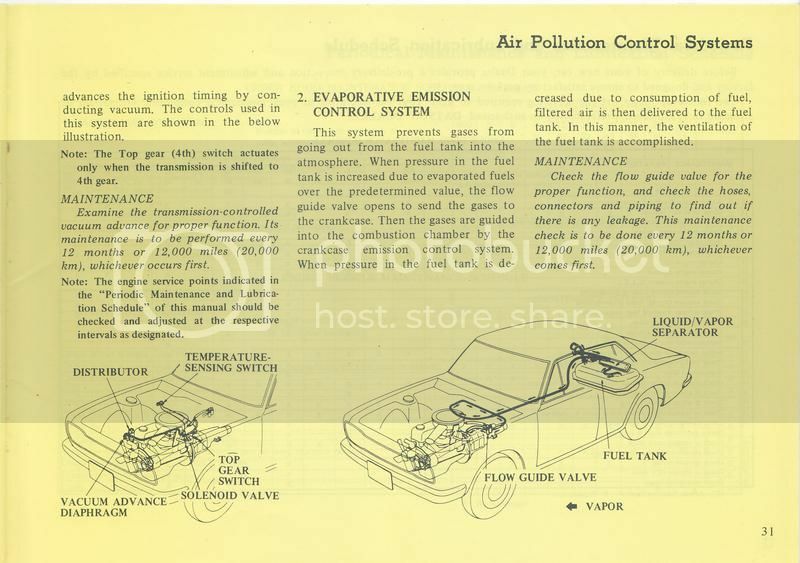 All USA models, and later Japan and Australia 1200 pickups were required to control the amount of gasoline vapor that escapes from a vehicle into the atmosphere. 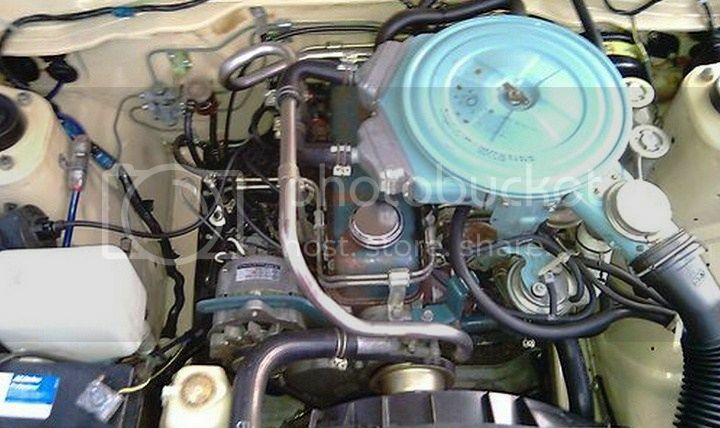 The Datsun 1200 used an early system that consisted of a sealed gas tank, and hoses to route the fumes from carburetor, rocker cover and air cleaner to appropriate places. Be sure to use the original 1200 gas cap, which has no pressure vent (only an air inlet (vacuum relief) valve, which is normally closed). 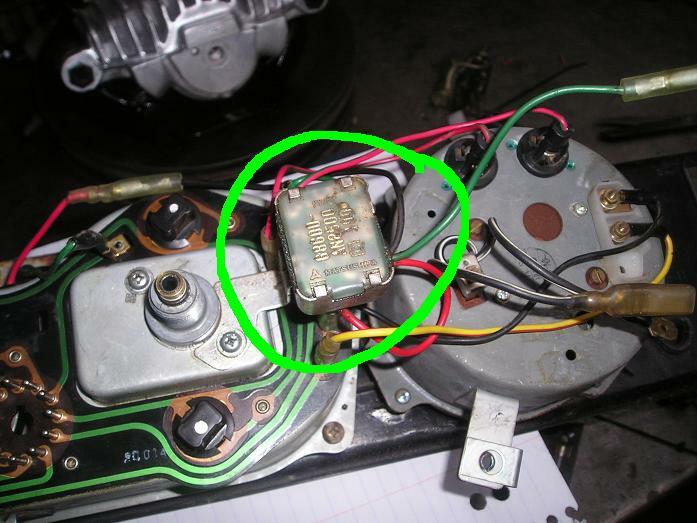 For details on how this works in the Datsun 1200, see Fume Control. 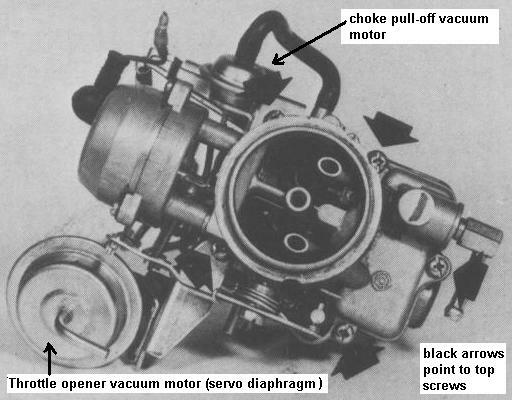 Ported vacuum for the distributor is provided by a carburetor fitting tapped just above the throttle plate. This gives zero vacuum at idle, but full vacuum at just above idle. 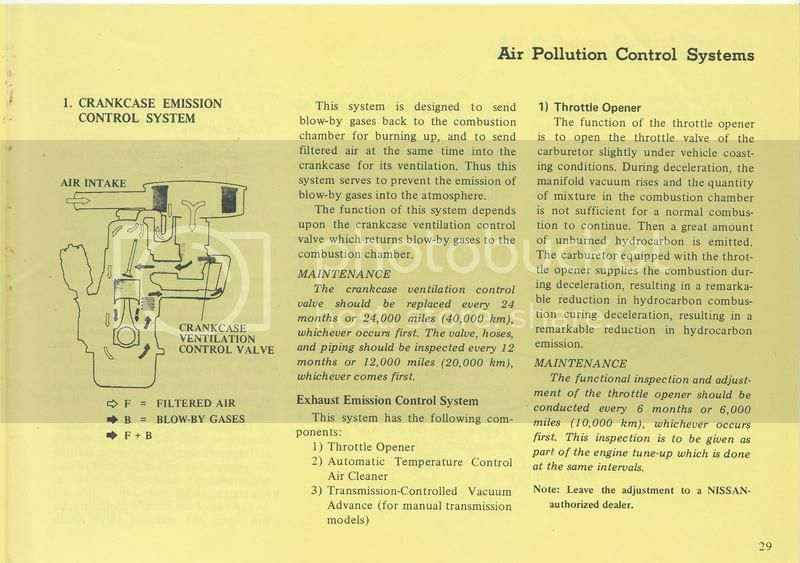 This is not technically an emission-control method, and was used prior to emission control. However it does help reduce emissions. It is an OK system and there is no need to remove it. 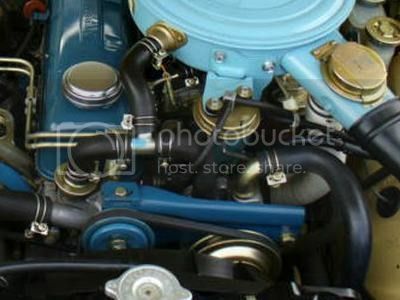 In fact, hooking up the distributor to the intake manifold directly will cause problems with setting the correct initial timing, as the standard specifications are for ported vacuum. For reduction in unburned HC, generally the spark timing is reduced from optimal-power settings. This results in a more complete combustion under certain part-throttle conditions. Spark delay prevents an immediate increase of vacuum advance when the throttle is closed, thereby preventing emissions spike. After 1-2 seconds the vacuum advance is applied as normal. USA: Not used with Datsun 1200. Spark Delay was first used with 1975 B210 with the A14 engine. Spark delay was fitted 8110-8910 for L-emissions (L-B122). R-B122 (9810-) did not use spark delay. JAPAN, spark delay may a requirement added after the 1200s were sold. It does not appear in the parts catalogs. 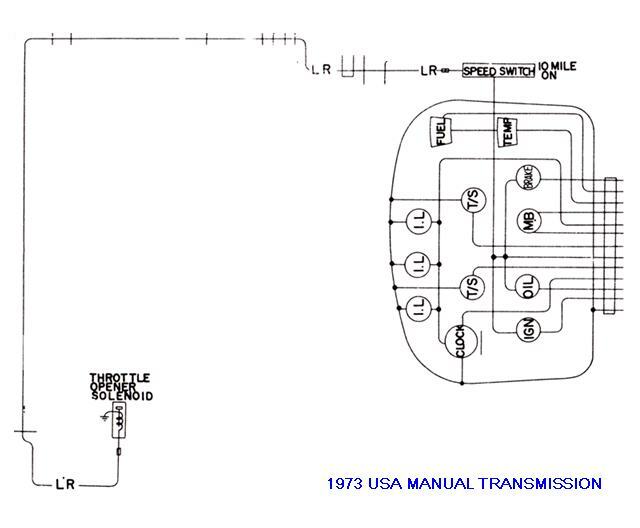 Starting with 1972 USA models, Transmission Controlled Vacuum Advance System (TCVAS) disables advance except in Top Gear. Since this "retarded" spark timing reduces performance, to prevent cold-engine driving problems this system is bypassed in cold temperatures. This means vacuum advance works normally at cold cabin temperatures. 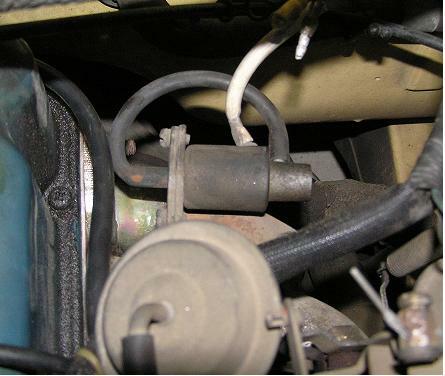 The Throttle Opener mounted on the carburetor to prevent the throttle from closing completely while the car is moving. This results in a drastic reduction of unburned HC. 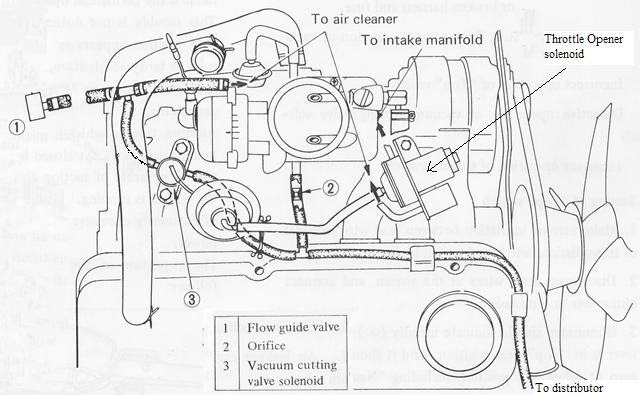 Carburetors are not efficient at high vacuum (closed throttle) high-speed conditions. So the Throttle Opener prevents this from occuring. The Opener is operated by engine vacuum. When vacuum is supplied to the carb-mounted diaphragm, the 'phragm pulls a secondary throttle linkage which prevents the throttle shaft from returning all the way to idle. To keep a smooth feel of the accelerator, the Opener only works at speeds above 10mph. 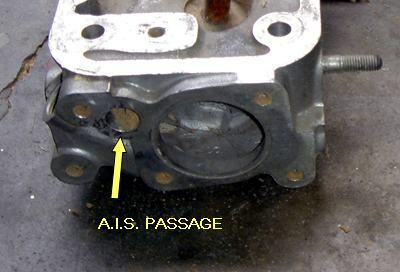 This is accommplished by a vacuum switch mounted on the front of the intake manifold just in front of the carburetor. The vacuum switch is operated electrically by the Amplifier Speed Switch, and electrical switch in the speedometer. 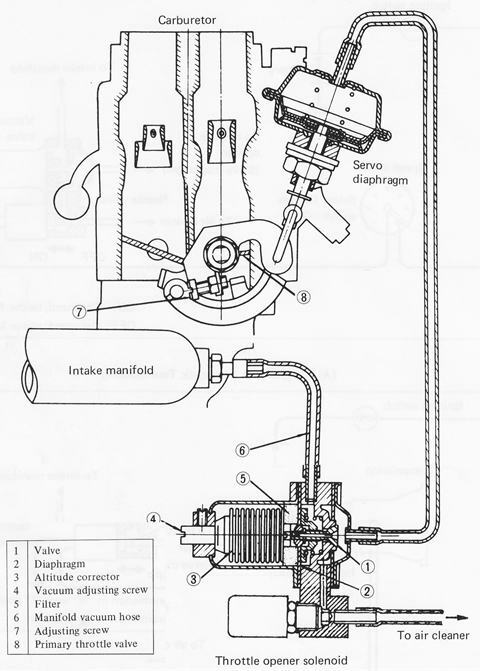 Thus there is a hose from the intake manifold to the switch and from there to the the Opener diaphragm on the carburetor. When the speed goes below 10mph, the vacuum switch opens (12V "on"), and vacuum in the diaphragm slowly bleeds off through a small jet and needle valve in the vacuum switch. Thus the throttle gradually closes all the way. It is a smooth transition you won't even notice. 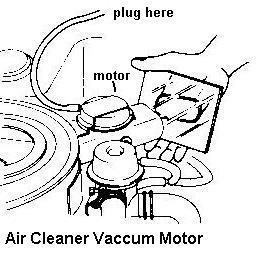 The vacuum bleeds off by letting clean air enter from the air cleaner. Thus there is a small hose from the switch to the air cleaner. In automatic-transmission cars, the vacuum switch is "off" in Neutral and Park (12V supplied to solenoid). At idle, there should be 12 volts supplied to the vacuum switch/solenoid unit. Also it should be supplied with engine OFF, Ignition Switch ON. The Opener used on the Datsun 1200 is fairly unobtrusive. It keeps the throttle slightly open during deceleration. Some newer cars made in the late 70s used fairly radical Openers that kept the engine at relatively high rpms and made for odd, highly noticeable throttle experience. 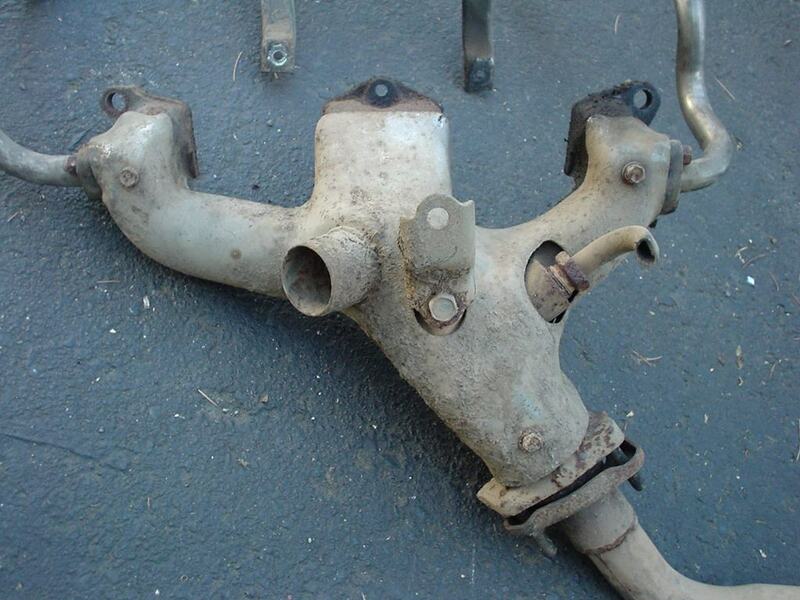 So if you are using a newer carburetor, keep this behavior in mind. Troubleshoot: Note that in the factory service manual, there are extensive procedures, diagrams, specifications and drawings. You should borrow, buy, or check it out from the Library. There is a screw adjustment on the solenoid. 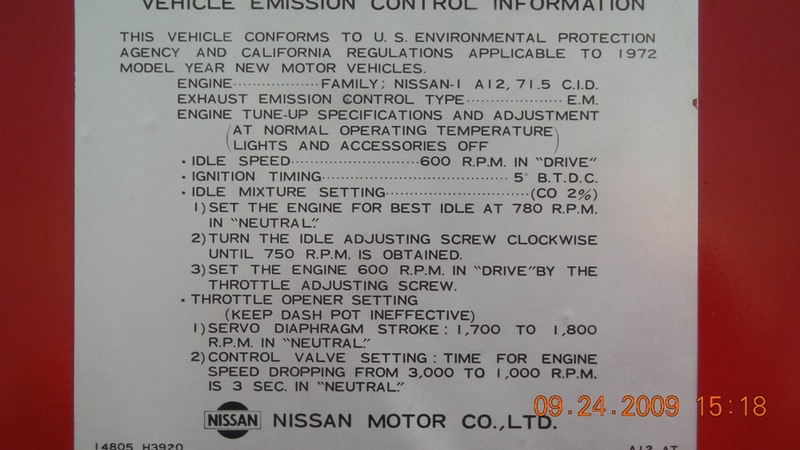 Adjust it to Nissan factory manual specifications. This is rarely a problem unless someone changed this setting. Normally it is set at the factory, and never touched again. 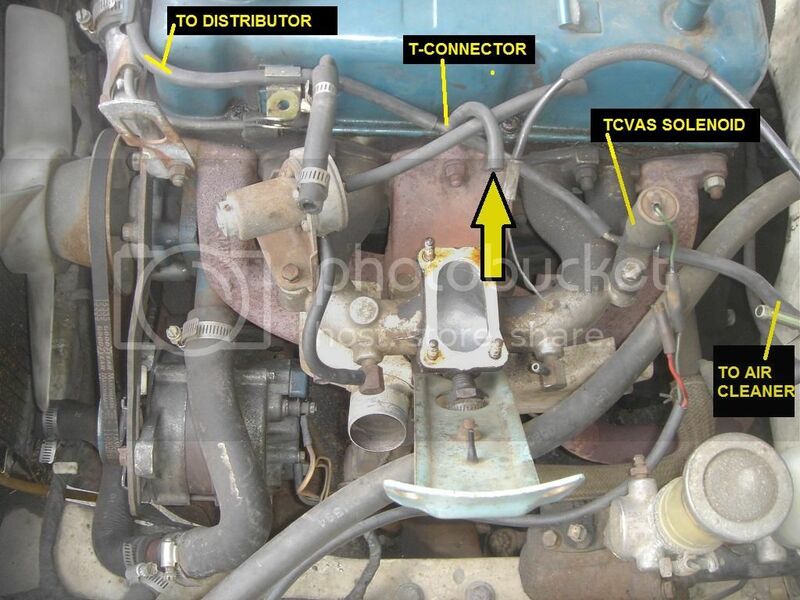 Adjust the Throttle Opener linkage on the carburetor per carburetor specifications. The Throttle Opener is de-activated only when the electrical connections are working correctly. If the wires becomes disconnected, it is "on" which results in an idle-speed problem. Auto trans Inhibitor Switch stuck "off"
electrical switch on speedometer is stuck "on"
If the engine idles better, it indicates a bad hose, a bad vacuum switch or lack of 12V to the solenoid. There is a one-way valve in the vacuum switch to prevent air from going into the intake manifold port. You can blow on the diagphragm side. If air comes out the Intake port of the switch, it is defective. Replace it or plug the intake port to disable the entire Opener system. Amplifier Speed Switch for Throttle Opener Assembly (see Emission Controls). It's only fitted to the Manual Transmission models. If your 1200 is missing the Switch, no worries. It drives OK without it, just slightly more emissions above certain speeds when decelerating. To reduce the amount of Carbon Monoxide (CO) and Unburned Hydrocarbons (gasoline), carb jetting is carefully controlled to burn the gasoline efficiently. The advanced original-equipment Hitachi DCH/DCG carburetors were fairly good in this regard. For the US market they were modified slightly lean in part-throttle use to reduce emissions. 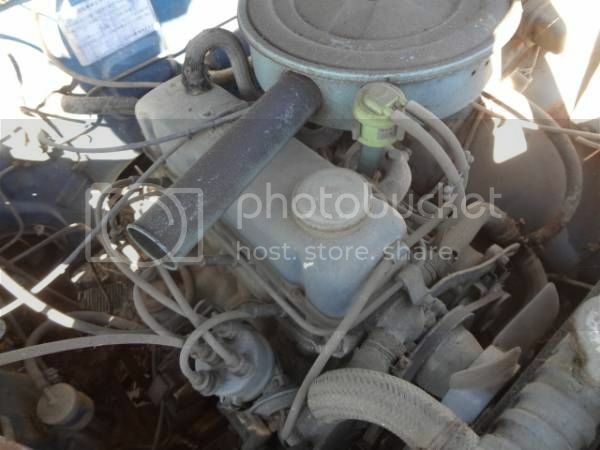 In general, Datsun 1200 carbs are richer than newer Datsun carburetors. Full-throttle operation, not being tested by US law, remained rich. However, after the Datsun 1200 years, the Hitachi was modified with more and more controls, increasing complexity and reliability. Engine "run on", where the engine "diesels" (won't stop running) after the ignition is turned off. 1973 models compensate for this by using the anti-diesel valve (fuel cut-off valve). Increase noise. The A12 engine is much quieter at 600rpm than at 750 rpm. 1973 US models feature an "idle-limiter cap" on the carb's idle speed screw so that users won't accidently change the idle too much. This is primarily to control CO emissions. 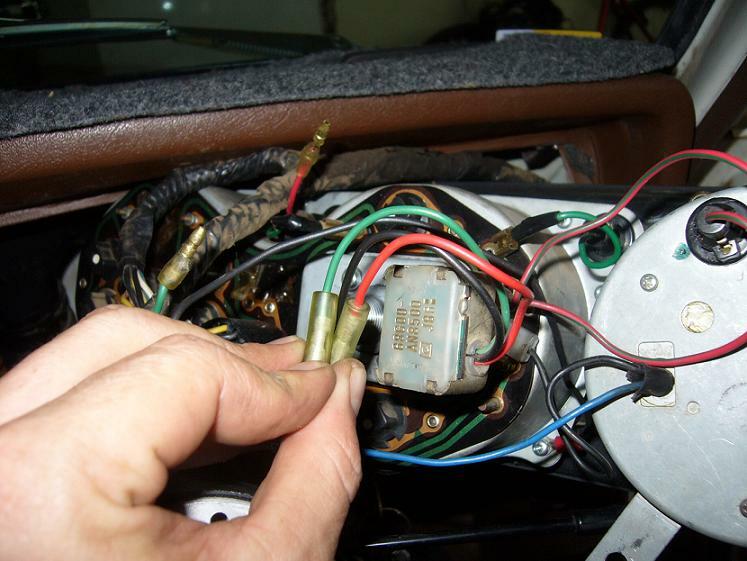 As the years go by and the carb wears and air leaks past the throttle shafts, it may be necessary to remove the cap to adjust the carburetor to a "good enough" setting. 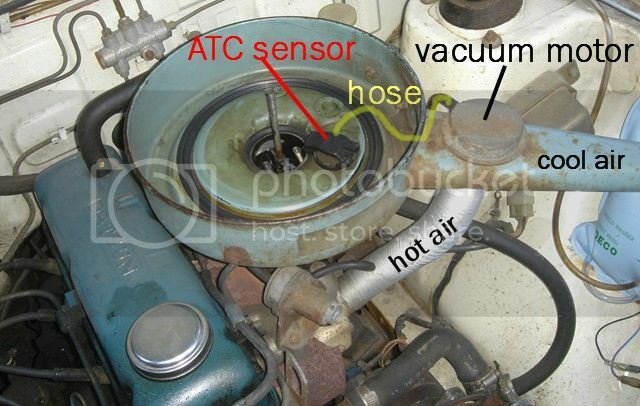 Nissan "Automatic Temperature-Control Air Cleaner" (A.T.C. Air Cleaner). Used on USA 1200 1972-1973 and Japan 1200 1989-. The Automatic hot air system not only reduces pollution, but by ensuring the carburetor is fed a constant-temperature air it aids fuel economy as well. 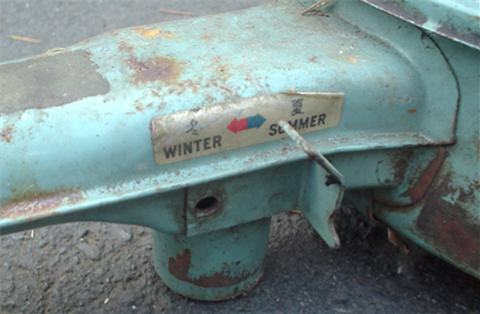 The carb can be tuned for slightly-lean cruising operation without be affected by cold temperatures. Only disable this system if you want maximum performance and are willing to re-jet the carburetor to match particular temperatures. Racers will sometimes re-jet for different days and track conditions. A special temperature regulating valve in the air cleaner proper. This modulates the flow of vacuum to the Diaphragm. 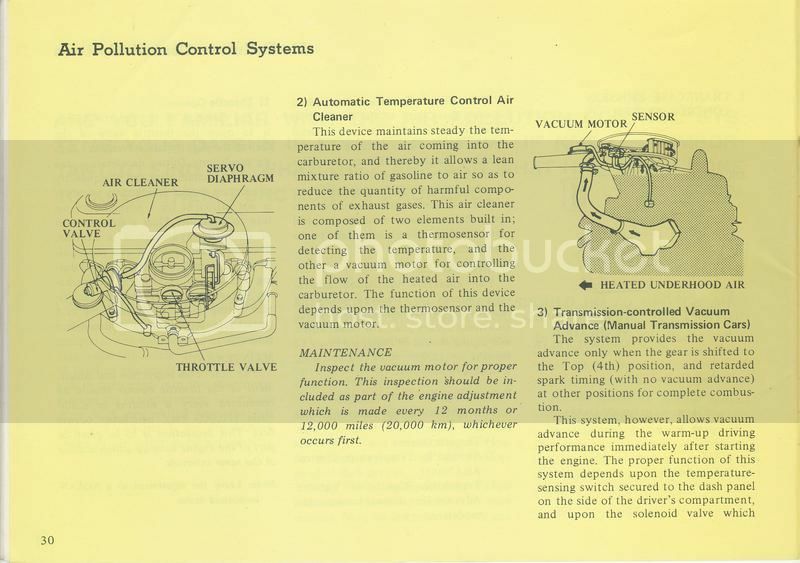 1972-up USA models used an automatic choke to better control air/fuel mixtures when the engine was warming up. 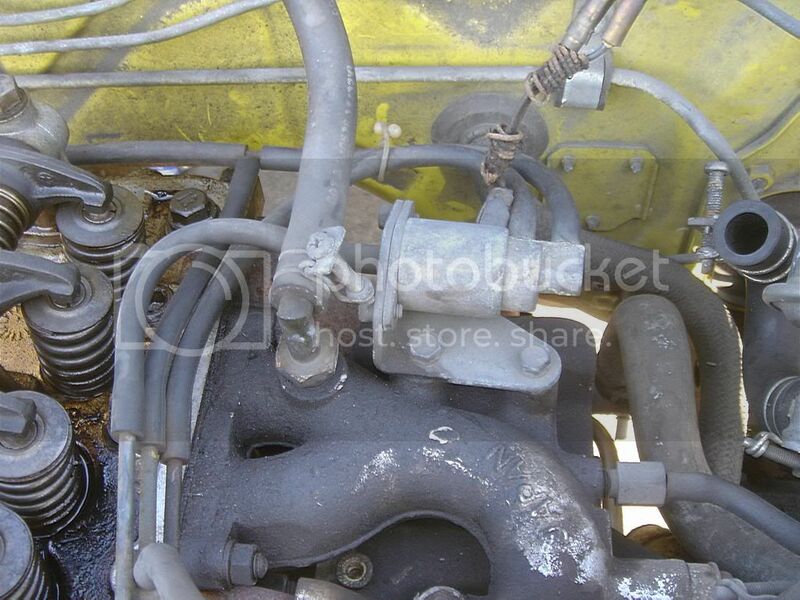 For details on the choke operation, see Carburetor Adjustment. 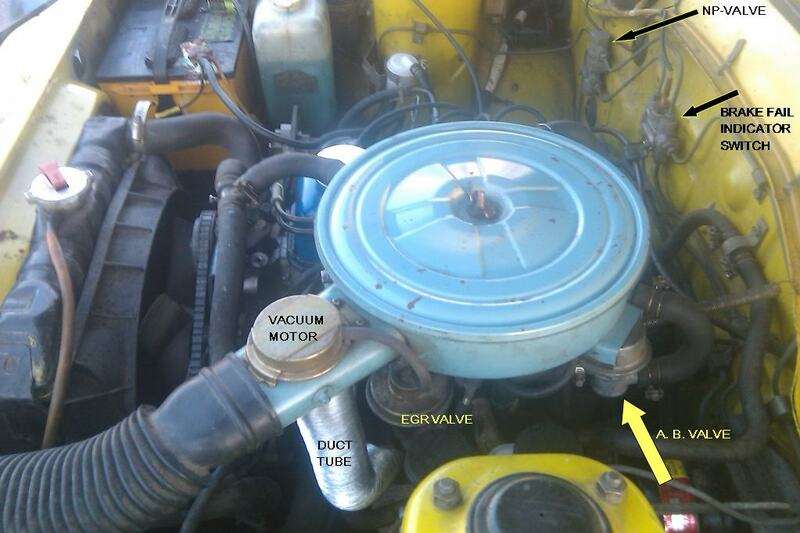 EGR (Exhaust Gas Recirculation) was first used starting with 1974 B-210 (North American B210) models. 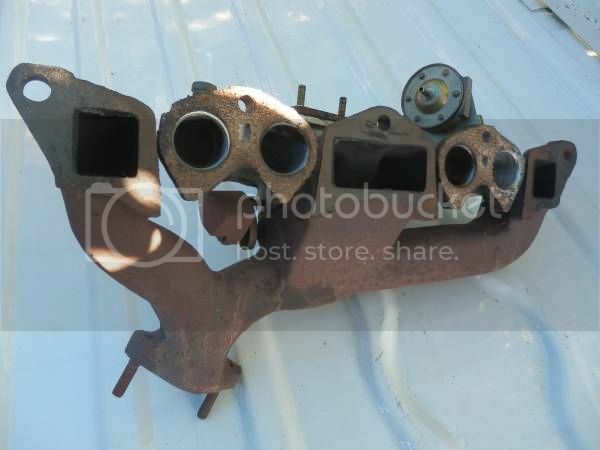 It recirculates a small portion of the exhaust back into the combustion chamber. Although this dilutes the the air/fuel mixture (reducing performance), the inert properties of the spent gas reduces burning temperatures resulting in drastic reductions of Oxides of Nitrogen (NOx). 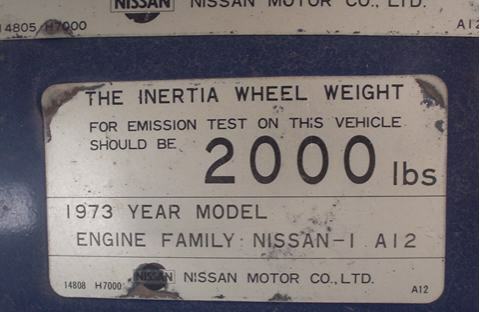 Catalytic Convertor were first fitted to Japan-market 1976 B210 (NAPS). The converter fits into the exhaust pipe system, and converts unburned hydrocarbons (unburned fuel) into less-harmful substances--namely water and oxygen. Early convertors were a restriction in the exhaust system, but newer designs are high-flow. New designs are not too bad of a system, although some use the Air Pump to supply extra oxygen to the convertor. For off-road use (e.g. racing) you can simply replace the convertor with a straight section of exhaust pipe. A.I.S. is Air Injection System. This pumps air into the exhaust system to further burn the exhaust -- which reduces HC and CO. The additional air is injected into a passage drilled lengthwise in the head from front to back, and which has cross-passages drilled to each exhaust port. So it gets the exhaust into "recombustion" as it leaves the cylinder. This alone does not hurt performance. However early versions used an air pump which takes some power to run. Later passive versions used no air pump so had minimal effects on performance. The Air pump air cleaner requires periodic replacement. The air pump uses carbon shoes, so eventually wears out. The pump may seize at this point. The air pump system -- a.k.a. 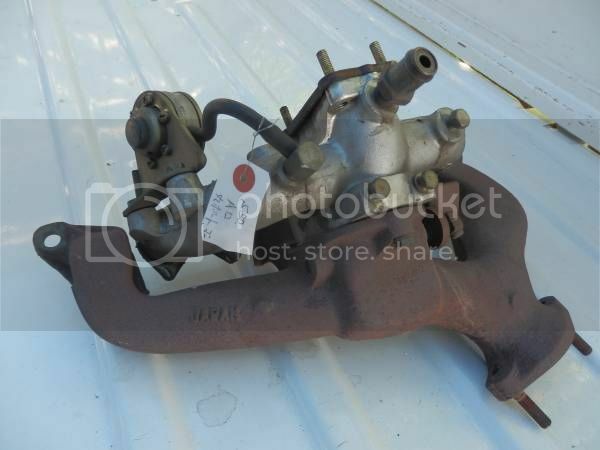 "smog pump" -- was first fitted to some 1960s Datsuns. 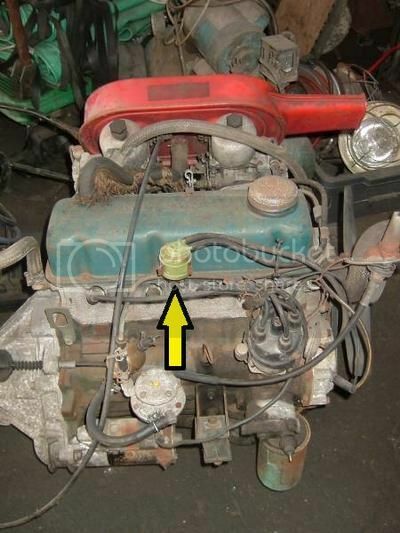 No Datsun 1200 was fitted with an air pump. The first B-series models to have an Air Pump was the North American B210 series for 1975. Japan B310 and 8110-up Sunny Truck was fitted with E.A.I., which is just like the smog pump system except without the pump. It inducts air into the exhaust ports (same as injected air) which differs from the USA system which puts air into the exhaust manifold (see #A.I.S without air pump). Starting in October 1975, all Japan-market B210 Van were fitted with AIS. In December 1975 with the introductions of the B211, Coupes & Sedans likewise were fitted (also including catalytic converters). 1976-1978 USA GFU B210s and 1978 Canada B210s use a simplified A.I.S. (Air Induction System). No air pump is used, but instead air flows via tuned port pulsation. This is different from the smog pump system where air goes into the exhaust ports. 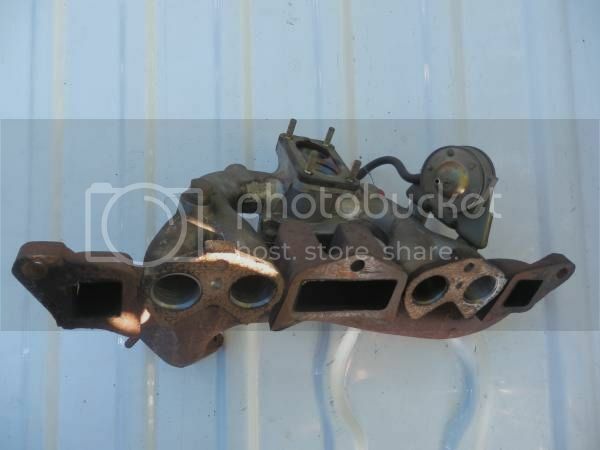 With AIS, air goes to the exhaust manifold. Air is inducted (rather than injected) into the exhaust system. 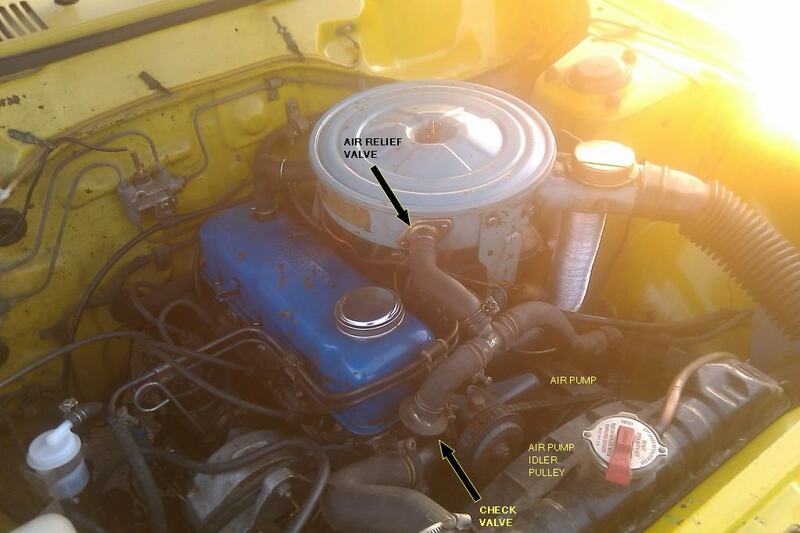 Late model (circa 1983) Australian utes, and USA 1200s, came with an air cleaner with a idle compensator. Which controls can be eliminated? For a race car, any you want may be removed -- though some are good for the engine. 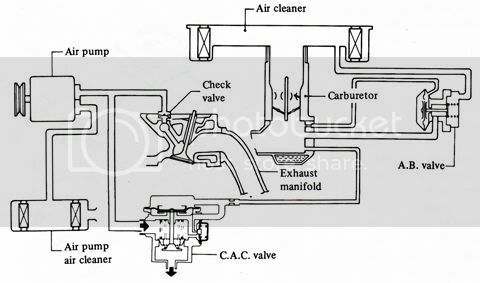 Positive Crankcase Ventilation (PCV): This is a good system, and can actually helps power and fuel economy. If you remove it, you should design an alternative system to keep oil out of the air, and oil fumes from causing sludge inside the engine. It is recommended to keep this for all street cars. Ported vacuum for vacuum advance is the carburetor fitting tapped just above the throttle plate. This gives zero vacuum at idle, but full vacuum at just above idle. This is a good system, and removing it (disconnecting Vacuum Advance) will result in poor part-throttle acceleration and fuel economy. 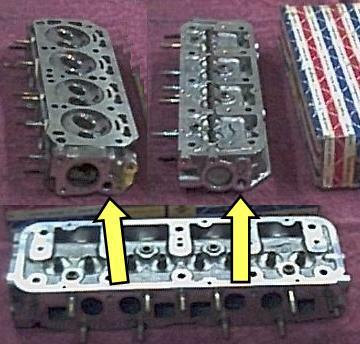 Connecting the distributor directly to the intake manifold can cause timing setting problems, as the standard specifications are for ported vacuum. Fuel Tank vapor recovery: This is a good thing, as why let gas fumes get into the air? They are easily controlled by venting the tank and the carburetor float bowl to a charcoal canister. 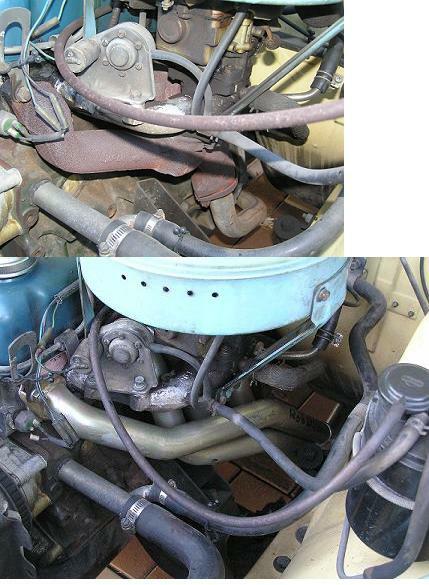 See your Datsun repair manual for an explanation of the various schemes used over the years. Also see Fume Control. EGR (Exhaust Gas Recirculation) hurts performance, and should be blocked for a race car. The easiest way is simply to remove the vacuum hose and block it with a plug. For a more streamlined look, remove the EGR valve and replace it with a block plate, and the hoses that control it. No other change is need, however if your engine starts to "ping" (pink) then either fit a 160-degree thermostat or carefully tune the engine to compensate. Air Pump (aka Smog Pump). This takes power to run, so for an off-road car should be removed. Remove the pump, block the exhaust manifold opening for it, and block the air hose fittings that are on the air cleaner. Catalytic Convertor can be removed for off-road vehicles with no loss of performance. Simply replace the convertor with a straight section of exhaust pipe. Throttle Opener is a fairly unobtrusive system on Datsun 1200s. It is recommended to keep it intact on a street car. For racing, where a 'snap' of closing throttle is desired, or where the Opener is defective, simply plug the port on the intake manifold thereby disabling the entire Throttle Opener system. No loss of performance will result, though invisible pollution will increase. A.T.C. Air Cleaner: Only disable this system if you want maximum performance and are willing to re-jet the carburetor to match particular temperatures. Racers will want to do this, although for best performance they should be willing to re-jet for different days and track conditions. The ATC increases fuel economy without having to re-jet for different ambient air temperatures, like summer vs. winter, night vs. day, etc. In constant-temperature climates, ATC is not as helpful. This page has been accessed 100,024 times. This page was last modified 09:56, 19 March 2019. Content is available under Datsun 1200 Club.